Sinclair Moving and Storage: Your Northeast Philadelphia Movers. Sinclair Moving & Storage has been the top family-run moving companies serving Northeast Philadelphia PA since 1923. We are your North East Philly Movers. Sinclair Moving and Storage can handle your move, whether you’re moving across the Delaware Valley or across the Atlantic Ocean. We take providing professional service seriously, requiring our drivers to be involved in continuing education, safety courses, and certification. Before sending our movers to your home, we ensure they go through a full background check and drug testing. With high-quality service in mind, our staff shows up uniformed and ready to take the stress of moving off your family. As a Mayflower Transit agent, we provide the quality families, and business owners have learned to expect. Our staff is fully trained in best packing practices, and our customer service representatives are on-call to help you through your moving transition. Our company has been honored with the New Jersey Warehousemen and Movers Association’s Service Award for Excellence, which serves as testimony for the quality of service each of our staff members aims to provide. Whether you are moving a full house or are relocating your small business, we can do the job. Our moving companys representatives perform visual estimates to help stay within your budget while planning for complications that can arise from different types of shipments and items. Our drivers serve as moving managers and will help keep track of your essential items through detailed inventory lists, and ensure all our customers have the right documents and information to serve them before, during, and even after a big move. Contact your NE Philly Movers at 800-282-7242 Today! Outside of center city, North East Philadelphia was once the home of Liberty Bell Park Racetrack. Philadelphia Mills, a shopping area, now occupies that location. The lower sections of the Northeast still boast pleasant shopping avenues lined by stores and restaurants, such as Castor Avenue. Major shopping centers along Cottman Avenue include the Cottman-Bustleton Center and the Roosevelt Mall which opened in 1964 at Cottman Avenue and the Roosevelt Boulevard. Also located in the Northeast are Fox Chase Cancer Center, and Friends Hospital, a mental hospital. Both are nationally recognized medical establishments. 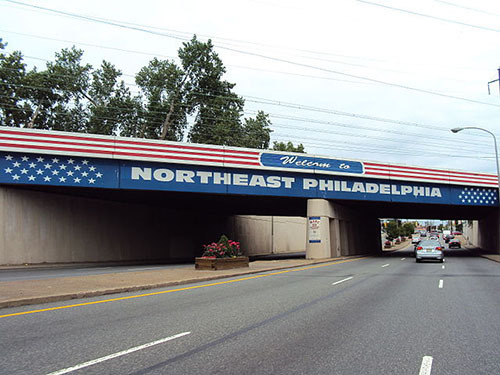 One of two airports that serve Philadelphia PA, named Northeast Philadelphia Airport (PNE), is located in this section of the city. PNE is reported to be the sixth busiest airport in Pennsylvania. The Great Northeast is also where you can find Pennypack Park. This municipal park was established in 1905 by ordinance of the City of Philadelphia. It includes about 1,600 acres primarily of woodlands, meadows, and wetlands. The Pennypack Creek, first surveyed by Thomas Holme in 1687, runs through the park. The park contains playgrounds, hiking and biking trails, and bridle paths for horseback riding. A haven for bird watchers, more than 150 species of nesting and migrating birds use Pennypack Park, including the tiny ruby-throated hummingbird, warblers, the great blue heron, several kinds of seabirds, the pileated woodpecker, hawks, ducks, geese, great horned owls and the little screech owl. The park is also home to a great variety of mammals, most famously its large, scattered deer herd. Also, you might find several kinds of bats, chipmunks, mice, the red and gray fox, rabbits, muskrats, groundhogs, weasels, opossum, raccoons, and skunks. Rounding out the list are many kinds of snakes, turtles, frogs, toads, and salamanders. Some famous (or infamous) people hailing from Northeast Philly include Jack “Legs” Diamond, a Prohibition-era gangster; Bil Keane, creator of Family Circus comic strips; Rich Gannon, former NFL quarterback and 2002 NFL MVP; Chris Matthews, political commentator; Andrea McArdle, singer and actress; and Sylvester Stallone, actor. With convenient locations, we serve throughout the Northeast Philadelphia area in neighborhoods such as Fishtown, Kensington, Port Richmond, Crescentville, Lawndale, Tacony, Rhawnhurst, Frankford, Holme Circle, Holmesburg, Upper Holmesburg, Mayfair, Morrell Park, Oxford Circle, Bustleton, Torresdale, Parkwood, Somerton, Fox Chase, Juniata, Pine Valley, Castor Gardens, Northwood, Burholme, Lexington Park, Ryers, Wissinoming, Academy Gardens, Byberry, Crestmont Farms, Millbrook, Modena Park, Normandy, Parkwood, Pennypack, Somerton, Winchester Park, Bridesburg, Harrowgate, and Olde Richmond. Whether you are business owners looking for commercial moving, or looking for apartment moving, Sinclair has the expertise to do the job. We arrive on time, can provide packing supplies, and we are known for our safe moving of your property.